What is it? VGO (Viral Genome Organizer) is our Java-based interface for viewing and searching entire viral genomes. What can I do with it? 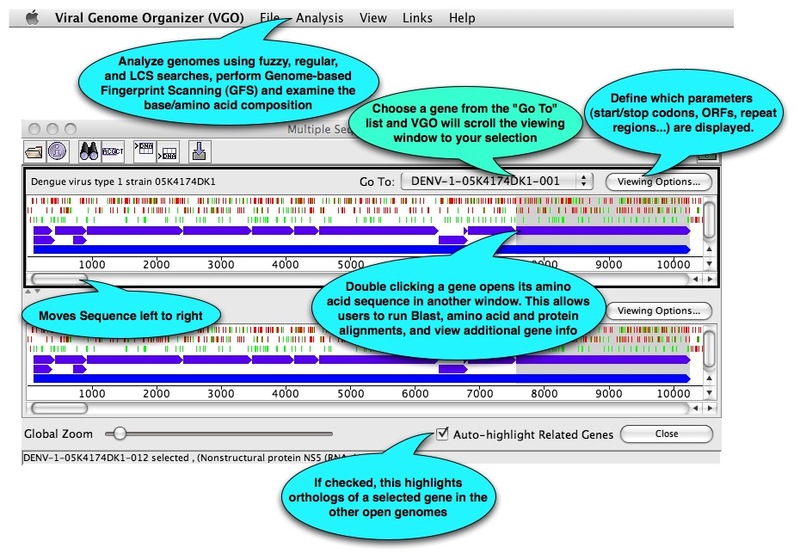 VGO’s main purpose is to allow you to quickly and easily view various large-scale genome features (e.g. ORFs, start/stop codons, annotations, genome search results, etc.) in graphical format. How do I get started? VGO can be accessed for free at www.virology.ca. From the VBRC Tools drop-down on the left side of the page, select VGO, then click the Launch Program button. VGO will be downloaded to your computer and Java Web Start will automatically start the program. Note: A warning message appears which requires users to authenticate VGO. This allows VGO to save wp-content/uploads/2018/12 to your computer. Begin by choosing a VOCs database of interest; then you can select one or more viruses. What next? The main VGO window and its functions are shown below.